Happy New Year, I love boulders, etc. This majestic beast is named Bananas. All photo cred to Sista Fran. I like to think that New Year's at Rocktown is now a thing. We went last year, and yesterday, we went again — although we rolled in pretty late post-NYE-ing. January 1st is probably the only day I will ever be OK with leaving at 7 a.m. for a climbing trip. Until I move somewhere with climbing less than three hours away, I guess. Which hopefully will be soonish but you know. Anyway, this time, Sista Fran got to come! Taylor has been climbing for longer than I have, but she had to take a bunch of time off and stays so busy she had never made it outside. 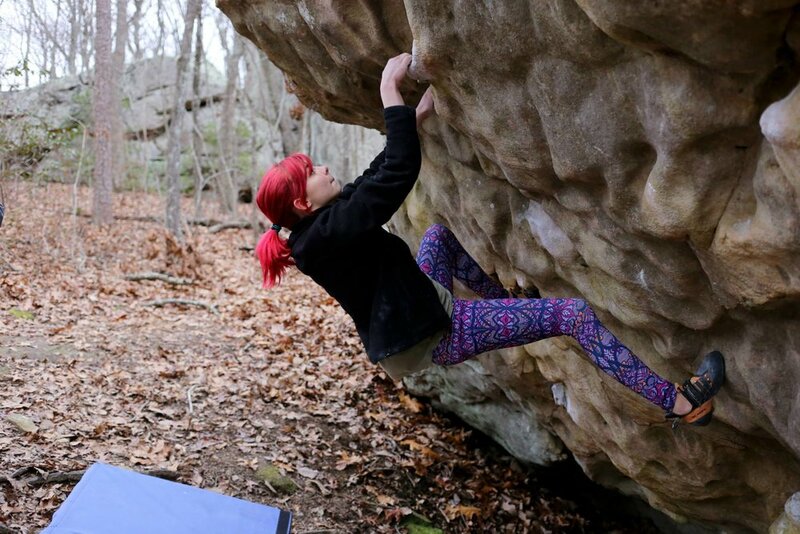 It was really exciting getting to show her around Rocktown, which I think is a pretty epic first taste of outdoor bouldering. In the weeks leading up to this particular trip (during which every day I had off was a day when it rained >:[ ), I for some reason imagined our crew as the only one in the park. I dunno, I guess I thought the rest of the South's climbers would be sleeping off hangovers? Well, I was wrong, and there were tons of people at the crag. Fortunately, they all turned out to be lovely folks full of friendly beta and encouragement, and they had dogs. So that was great. Don't you love that girl's hat? She has strong fingers and a little dog named Rumi. Since the Orb area was packed when we arrived, we headed to some apparently classic other climbs to warm up. One was called El Clásico, but I don't recall which one it was or what the other thing we climbed was called. They were both kinda highbally for my tastes, but Taylor was pretty fearless on them. Still, I was excited when I finally got to show her my favorite zeros and ones in the Orb area at the end of the day. There was so much joy in the day. See Nick's joy? More joy. And Sam. And Sam's hat. Since we really only had about seven hours of good climbing time, we didn't go all over the place like we otherwise might have. The guys worked on Golden Harvest (V10) and The Orb (V8), and Lucy and I projected The Hobbit (V5), Golden Showers (V5), and Soap on a Rope (V4) — all of which I think we can send in another session or two. I worked on them with Elaine a couple of weeks ago, and I am more psyched on these three problems than on anything else I've tried, ever. I < 3 slopers! I found myself feeling unreasonably relieved at the end of the day (which by the way was perfect and ended with vegan pizza at Mellow Mushroom) when I realized that with the exception of a single bloody pinky, I had not injured myself. You see, a year ago yesterday I fell while attempting what would become my first V3, Super Mario, and sprained my ankle. It wasn't really that bad, but that was when I first developed a teensy fear of falling. (It reached the ludicrous proportions we now know after my first bad lead fall, but we can talk about that later.) My ankle is still swollen... maybe I should be worried about that? Anyway. I didn't get hurt, and I'm happy about that, because maybe it means I broke some kind of curse under which the climbing gods would otherwise have me dwell. I really think my pull-up obsession (I'm up to eight!) is starting to pay off. Not in the ways I thought it would — lock offs are still just ugh — but my abs are definitely stronger, and static-but-strengthy movement is way more possible than it was a few months ago. I so recommend pull-ups to any girl (or, I guess, person) trying to get stronger fast. 1. Be more of an adult. This means wear "real clothes," budget better, spend my time wisely, and wear makeup when I feel like it. 2. Make more music, see more music. It's always been a huge part of my life, except recently, and I miss it a lot. 3. Don't say "no" without a reason. I'm in the terrible habit of turning people down when they ask me to do something simply because it wasn't part of how I originally envisioned my evening. Or saying that I'll go to a show or something and then not because my bed is so cozy or it's cold outside or I don't wanna put on pants or whatever. And I just need to start going. I don't want to make resolutions about climbing. I'd rather see what happens. I know I'm working hard and that's how you progress. But I'm also realizing climbing can't be my number one priority right now; I've got to make money and study and apply for jobs and graduate and all that. But I'm not worried : ) 2015 is off to a great start — I climbed at my favorite place with some of my favorite people yesterday, and today Taylor and I started Yoga with Adriene's 30 Days of Yoga. Tomorrow, I'll finish up an article for Flagpole, and I might paint my nails post-gym!